Financial centre of Doha – Qatar. 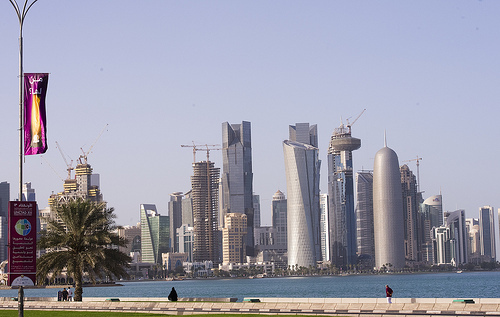 UNCTAD ministerial conference held in Qatar agreed on the “Doha Mandate”, focused on trade and development in the aftermath of the 2008-2009 economic and financial crisis. (UNCTAD photo library). Stocks of European Union direct investments to the rest of the world amounted to €5 trillion at the end of 2011, marking an increase of 50% during the period of 2008-2011, according to Eurostat, the statistical service of the EU. In 2011 however, the yearly inflows of foreign direct investments (FDI) into the 27 EU countries from the rest of the world declined sharply, according to data released by the United Nations Conference on Trade and Development UNCTAD). In detail at the end of 2011, the 27 EU countries held Foreign Direct Investment (FDI) stocks of €4,983 billion in the rest of the world, while stocks held by the rest of the world in the EU27 amounted to €3,807bn. This means the EU27 is a net investor in the rest of the world. Both stocks held by the EU27 and those held by the rest of the world have risen steadily between 2008 and 2011, increasing by about 50%, while EU27 stocks held in another member state have risen by around 20% during the same period. It should be noted however that stocks held in the rest of the world represent about 40% of total EU27 FDI stocks, with 60% held in another EU Member State. This is a clear indication that intra-EU27 direct investment activity is much more important than outgoing FDIs from the EU 27 member states to third countries. United States and Switzerland are the main partners of the EU27, as long as direct investments are concerned. According to Eurostat, the main destinations of EU27 investments outflows were the United States (€1,421bn), Switzerland (€598bn), Brazil (€239bn), Canada (€222bn), Russia (€167bn), Australia (€125bn), Hong Kong (€124bn) and China (€102bn). As regards FDI stocks held by the rest of the world in the EU27, the leading partners are similar. Main investors are the United States (€1,344bn), Switzerland (€467bn), Japan (€144bn), Canada (€138bn), Brazil (€78bn), Norway (€75bn), Hong Kong (€64bn) and Russia (€53bn). Now concerning the 2011 FDI inflows there was a marked decrease to levels seen ten years ago, according to UNCTAD. Of the global decline by $300bn in FDI inflows, from $1.6 trillion in 2011 to an estimated $1.3 trillion in 2012, almost 90% was accounted for by developed countries. FDI declined sharply both in Europe and in the United States. Germany posted a large decline from $40bn in 2011 to only $1bn in 2012, due to large disvestments. With the return of stability and confidence in the Irish economy, which was severely hampered by the banking crisis in 2008, there has been a revival of multinational corporation activity in the country. FDI inflows to the Southern European countries hit by the crisis (Greece, Italy, Portugal, and Spain) the overall inflows more than halved between 2011 and 2012. In Spain inflows declined from $29.5bn in 2011 to $17.5bn in 2012. Inward FDI to Portugal fell but remained at a relatively high level, helped by Chinese acquisitions of state assets in the energy sector. Inward FDI to Greece remained marginal but saw a rise, mostly explained by injections of capital by parent multinationals to cover losses of their affiliates, mainly in the banking sector (French banks). « Can elections in Italy and Germany derail Eurozone?